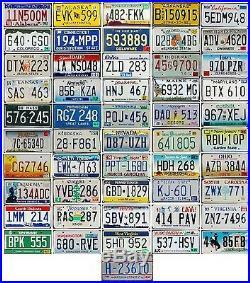 These are all genuine actual license plates used on cars and trucks in their respective state on the roads of America! This set also includes the elusive Washington DC car plate! Picture is representative of a typical set. You'll receive most of the same plate styles shown, but some styles will be different. All plates will be in Very Good or better condition - most will be excellent or better. A plate that grades Very Good will show very minor signs of use, usually confined to around the bolt holes. These are our STANDARD sets - our most popular. In these sets, we send you sets already built "off the shelf". Thus, some styles may differ from the photo, but generally at least 40-45 of the styles shown are in every set. We also have premium sets with exact plate designs shown and customizable sets in which you choose the plates you want and at the lower end, budget sets with some damaged plates. Check our other listings f or more information. States for over 10 years. Over 2500 sets later, we have hundreds of happy customers - many who have bought several sets. Some of our customers have used these sets to display in classrooms, garage walls, restaurants, and theme related businesses such as auto repair shops. Some customers even use the plates for their own collections and trading stock. We have over 20,000 United States and Canada license plates in stock at any time and can build you custom orders of any size from one plate to one thousand plates! We have older vintage plates as well as modern graphics exploding with color and design. We love to sell one plate or bulk plates! If you have a specific need or request, give us a try. You will receive plates in great condition at a great price. They are not valid for use on any vehicle and are to be used for display or collectable purposes only. Expiration dates for plates in photo range from 1966 thru 2005. Automobile License Plate Collector's Association (ALPCA) member since 1994. The item "FULL SET 51 USA License Plates All 50 American States Plus WASHINGTON DC" is in sale since Saturday, August 16, 2014. This item is in the category "Collectibles\Transportation\Automobilia\License Plates\US\ Mixed State Lots". The seller is "paranogonah" and is located in Reseda, California. This item can be shipped worldwide.